In mid spring, I went on a buying trip with my new friend Sheila. 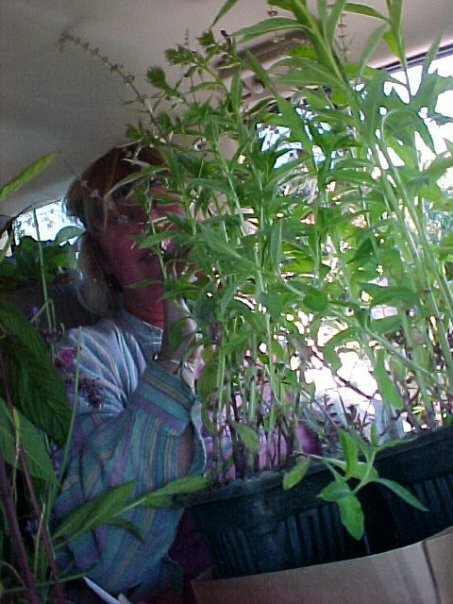 Even though she lived on the Peninsula at the time, we had actually met online on a garden forum. We did not connect in person until after Robert’s heart attack. 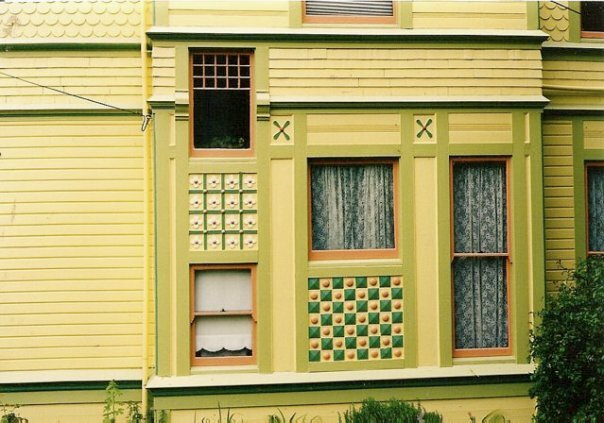 We were accompanied by an out of town forum friend, Kelly D.
I worried about going anywhere, even for a day, but Robert’s doctor had given him the all clear and he had chosen to get active again, even starting to paint the front of our house….much to my concern. I know some photos got lost because there is no way I would have gone to Cistus and Joy Creek without taking garden photos, but all I have of the trip are the ones of our loot. 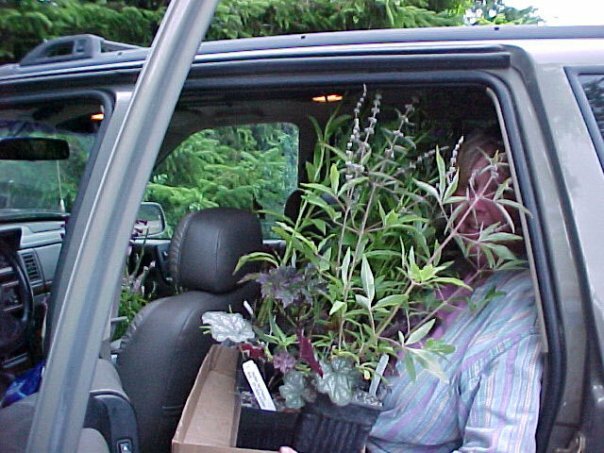 Typically, we bought so many plants that I had ridden the whole 2 hours home from Scappoose with a flat of plants on my lap, engulfed in greenery. I have no idea why this photo is so small, but here (left) are my acquisitions from the trip. Plant collector friends would give me money to buy something for them; I could not at the time afford to buy all these plants for myself, but knew I could eventually get divisions from some of them. Sheila and I led a Peninsula garden tour for the ten or so people who came to the weekend, followed by an evening around the campfire in the motel courtyard and a hypertufa workshop. In 1994, the garden was mostly lawn, the big tree, and the pond. The sight of a frog on the rock in the pond inspired us to buy the tiny cottage. 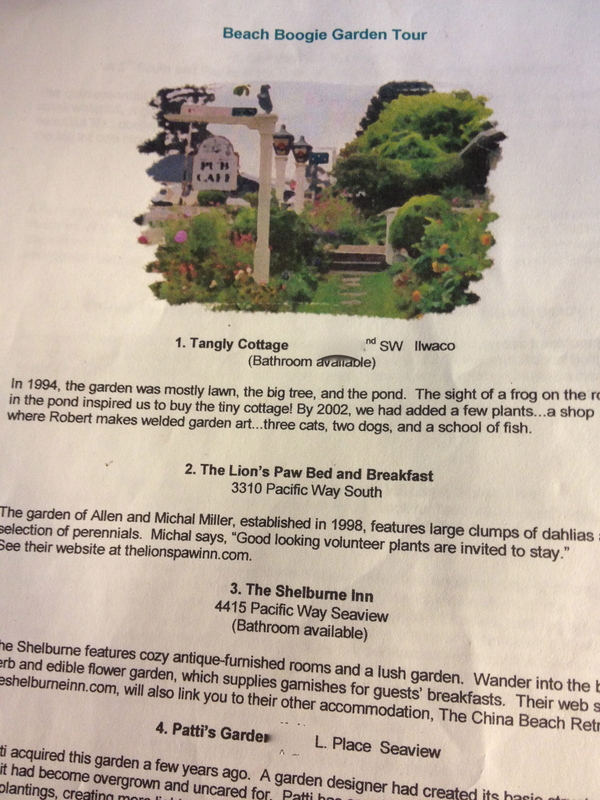 By 2002, we had added many plants and a shop where Robert makes welded garden art and three cats, two dogs, and a school of fish. 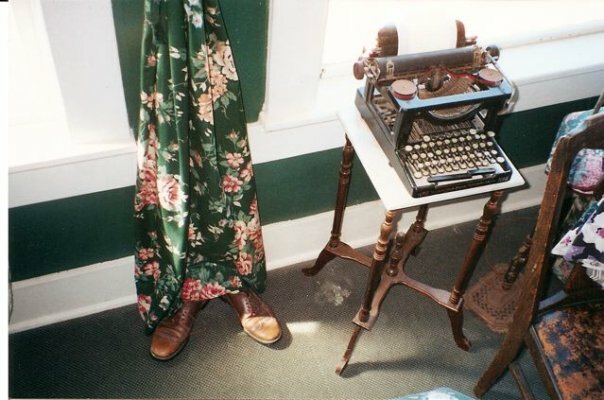 The Shelburne Inn features cozy antique-furnished rooms and a lush garden. Wander into the back herb and edible flower garden which supplies garnishes for the guests’ breakfasts. Patti acquired this garden a few years ago. A garden designer had created its basic structure, but it had become overgrown and uncared for. Patti has spent her time in the garden changing the plantings, creating more light and space, and making it her own. 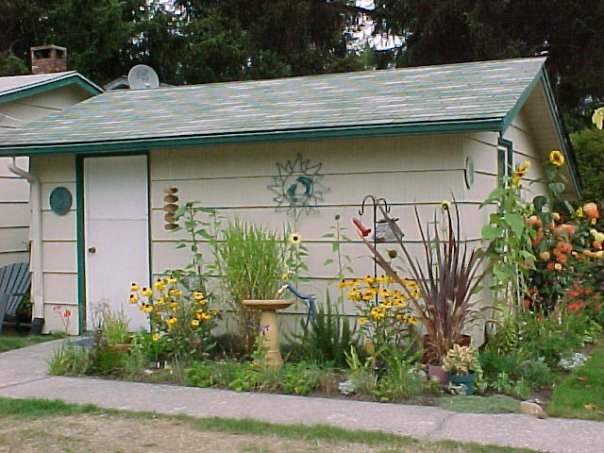 It features chickens, an enclosed vegetable garden, and a mini-pond. The quintessential Long Beach can be found in this quartet of mini parks on Fifth Street, featuring a pond with a small waterfall, a giant clam that squirts every hour on the hour, an enormous frying pan, and a restroom which might prove quite useful. There is lots of parking in the big lot one block east of the park and a small café by Marsh’s where you can buy lunch. A favourite secret garden in Long Beach is the home of Jo and Bob Fitzsimmons. Although small, its series of garden rooms give it an expansive, magical, and always surprising feeling. 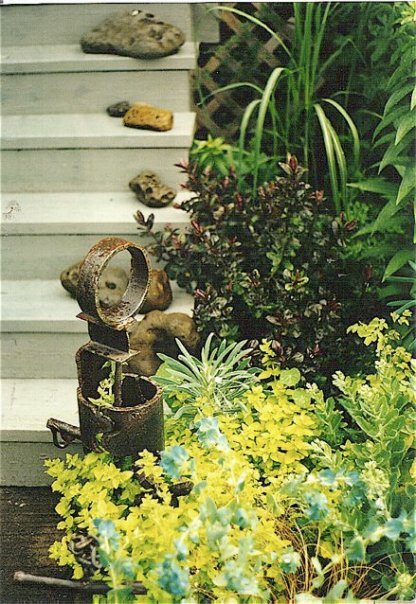 The sunny deck abounds with containers and Jo’s whimsical touches. Throughout the summer the house and garden are full of friends, children, grandchildren, a dog or two, quilting parties, and good times. A couple of years ago, the deer who live on the KBC grounds inspired a garden transformation. The rascally deer kept eating Mary’s Red Rascal miniature roses. So Denny and Robert built a fence and Skyler and Mary picked out even more roses…New Dawn, Climbing Cecile Brunner, Eden, Polka, Jude the Obscure, and more. Now the deer come to the outside of the fence and nibble a stray branch, but otherwise the roses are safe and laden with blooms. See their website at http://www.klipsanbeachcottages.com. Owner and gardener Kathleen’s description of the garden: In the garden itself: the white blossoms of the Rugosa ‘alba’ rose, undemanding of strong sunlight, the exclamatory pink of Rose Campion, the garish oranges and yellows of the rambunctuous nasturtiums, tenderly rampant across and through all obstacles, pushing against sheds, climbing the porch, edging into the road and across the gravel and threatening to smother the asparagus. The salmon pink of an Oriental poppy, the sulpherous yellow of the Evening Primrose, the pale violet of the catmint, all struggling out of the mud or sand, into the floating world, into a dream of flowering, of heat and light and fragrance. 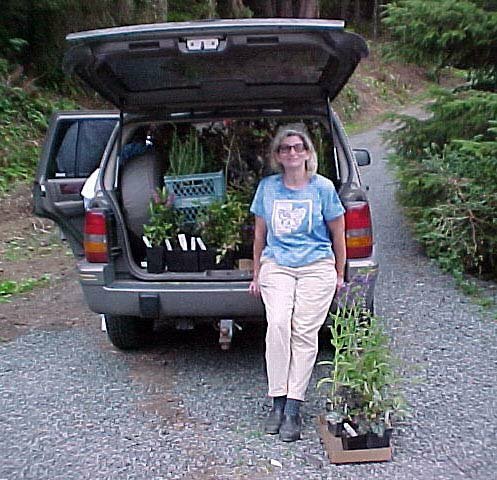 In their garden encompassing both sides of the road and in their piece of Willapa Bay, Larry Warnberg and Sandy Bradley grow everything organically, from vegetables and flowers to oysters. The garden is enriched with manure from rabbits, chickens, composting toilets, and mulched with spartina grass. See their website at http://www.solartoilet.com. The tour provided fun for all the gardeners, hosts and guests. 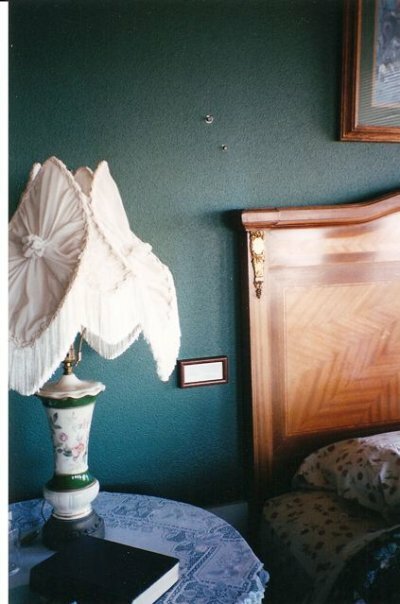 Mary treated me to two nights in the coveted Agatha Christie room in the fall of 2002. I have no idea why I have no photos of this wonderful two night stay, except for this and 2 other photos by Mary. 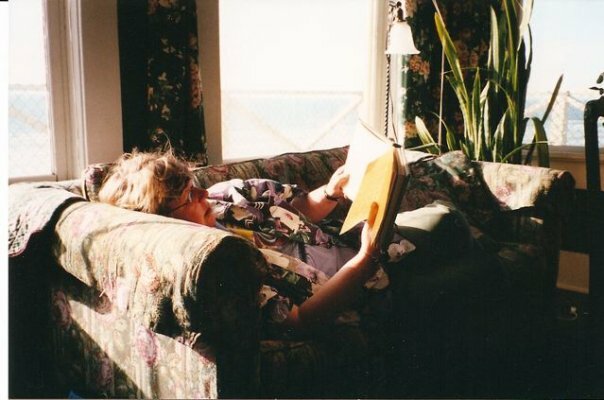 I was reading one of the room diaries; they are to me the greatest joy of staying at the SBH. Getting away from the difficulties of life at home had become more and more alluring, and there would be a lot more escaping in 2003.